Wedding sets and wedding bands from DiamondsHere. Welcome to DiamondsHere.com Bridal Department!..........Tuesday, January 29, 2019...........WE ARE HERE TO SERVE YOU! 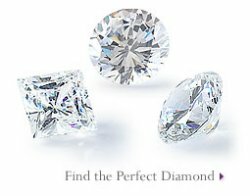 Please call with any special requests you may have...DiamondsHere.com stocks a HUGE variety of handpicked certified diamonds (please click on diamonds!) to help you create the perfect ring! 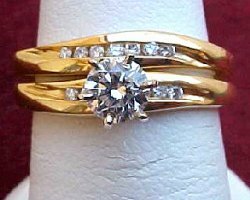 At DiamondsHere.com we specialize in Bridal sets designed in 14K or 18K white or yellow gold or timeless platinum! 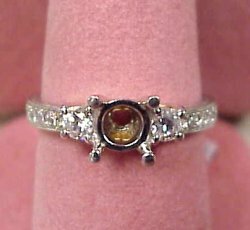 We have been a full service company for all your bridal jewelry since 1984! Be sure to check out our latest Fine Jewelry lines from the HOTTEST American and European JEWELRY DESIGNERS!!! 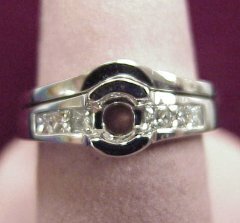 Be sure to check out our inventory of certified diamonds. Each beautiful diamond is individually selected for cut and brilliance...and ALL are priced at discount prices!...DiamondsHere.com store hours...OPEN 6 DAYS A WEEK 9:00 a.m. to 5:30 p.m. Saturday hours: 11:00 a.m. to 3:00 p.m. (Pacific Time)....Thank you for choosing DiamondsHere as your source for Fine Jewelry! The center diamond is 0.40CT round brilliant cut of F Color, SI1 Clarity and accompanied with 11 diamonds totaling 0.12CT TW all set in beautiful 18K gold! This wedding set is finely crafted with exquisite detail and workmanship. The center diamond is 0.22CT round brilliant cut of G-H Color, SI Clarity with 37 pave' set melee diamonds ( 0.55CT TW) and constructed of 14K gold. Elegant and affordable say it all. You do not have to pay ridiculous retail prices for your wedding rings! Check out our latest selection offering you discount prices and value for your money! Your satisfaction is guaranteed at DiamondsHere...AND...NO SALES TAX IN OREGON! 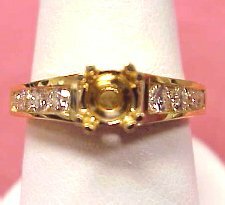 Check out this wedding set...0.25CT TW of G Color, SI1 Clarity round brilliant cut diamonds set in this 14K gold wedding set! 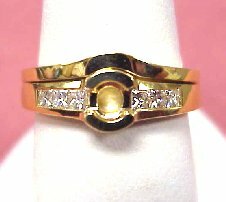 0.29CT TW semi-mount 18K gold wedding set. 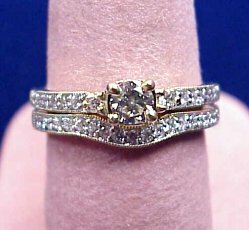 0.51CT TW diamonds of G Color, SI2 Clarity, set in a 14K gold bridal with our popular six-prong setting! 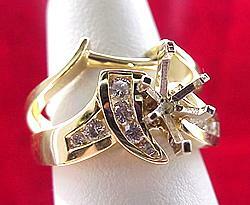 0.26CT TW round brilliant cut diamonds of G Color, SI2 Clarity set in 14K gold! 0.82CT TW of premium cut (near Ideal) round brilliant diamonds...all G-H Color, VS2-SI1 Clarity, (we think better) A beautiful ring! 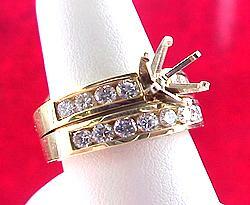 Each diamond is smartly channel set in a lovely extra heavy 14K gold mounting! Don't forget to select your diamond after you have found the perfect mounting. Check out our selection of loose diamonds at...DiamondsHere.com Certified Loose Diamonds Dept. 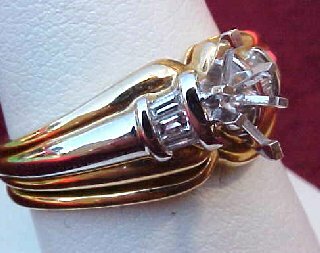 0.12CT TW of baguette cut diamonds set in a 14K two-tone gold mounting. 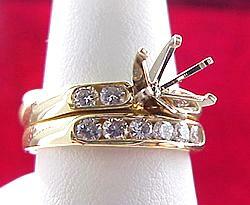 The mounting comes in a six-prong marquise style setting. 0.30CT TW princess cut diamonds enhance this very popular wedding set. The half-bezel will hold a 1/3 carat stone very securely and the low profile setting will bring the ring altogether..
0.71CT TW semi-mount diamond ring. 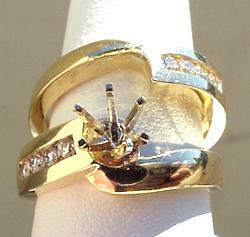 This ring contains 24 round brilliant cut diamonds mounted in 18K gold. Hand Engraved Platinum and 18K Wedding Ring. WOW! Check out the detail in this hand engraved platinum and 18k gold wedding ring. This exquisite piece will stand alone with the fine detail surrounding all sides. This semi-mount is enhanced with 0.44CT TW of round brilliant cut diamonds. Check out our selection of certified loose diamonds to complete this exquisite piece.